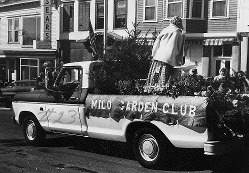 Milo celebrated its 150th anniversary in 1973. There were events scheduled all through the summer, culminating with a huge parade in early October. MILO – The seventh annual summer festival, sponsored by the Parish of St. Paul, Milo, and the Parish of St. Francis Xavier, Brownville Junction will be held at Milo, July 7 and will honor Milo’s Sesquicentennial. The sesquicentennial committee of the town has also planned special events to coincide with this annual event. 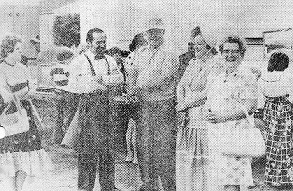 Festivities will start July 5 with a pot luck supper to be held at 6:30 p.m. at the Milo Town Hall when Brothers of the Brush and Ladies of the Bonnet will meet. The public is invited to join in the festivities of this evening. On July 6 at 6 p.m. a parade of doll carriages and bicycles, decorated especially for the event will form at the Milo Legion Field. The parade will be led by the Milo Fire Department and a musical group to the fire-department yard where trophies will be awarded to the doll carriages and bicycles judged to be the prettiest or most original. In case of rain this event will be held the following day. 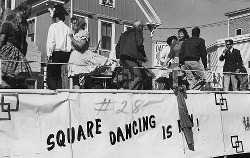 Square dancing will be the order of the evening, starting at 8 p.m. and continuing until 11 p.m. at the Milo Parking lot with Phil Junkins as the caller. In case of rain this event will be held at the Milo Town Hall. On July 7 the booths will open at the American Legion Field at 10 a.m.. In case of rain all outdoor events scheduled for this day will be held at the Milo Town Hall. At 4 p.m. the judging of the beard and mustache contest will be held. There will be five trophies awarded: for the fanciest beard, the fullest or bushiest and the longest; also for the fanciest and longest mustache. A public supper of bean-hole beans will beheld at 4:30 p.m. at the Legion Field, followed at 7 p.m. by a Folk Mass at St. Paul’s Church, Derby Hill. All during the week of July 2-7 clerks in the various stores will be dressed in costume. Men not sporting a beard mustache or sideburns and any woman caught not wearing a long dress or sunbonnet will be fined during the hours of 8 a.m. to 4 p.m. July 7. The sesquicentennial committee is working out plans for an old fashioned field day to be held in August with the date to be announced. Such events would include tug of war, log rolling, and a canoe racing will be scheduled. 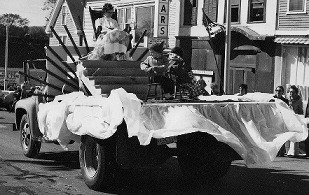 On Oct. 6 the committee, expects 60 floats to enter the scheduled parade; and the antique car club will be present to add to the attraction. Other events on this date include an outdoor band concert and fireworks. Smooth faced men were in trouble in Milo during Sesqui-week-end. It was “wear face hair or be arrested” on Friday and Saturday. Officer Jim Marks has Arthur Carey, manager of the Milo Water District, in cuffs and on his way to jail for being clean-shaven. He escaped his fate by paying a fine of 50¢ which will be used to provide fireworks at a later Sesqui celebration. 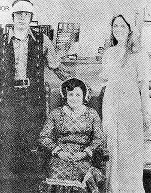 At Tom Howard’s Western Auto Store, Tom Howard, Althea Thombs and Vicki Howard posed in old fashioned costume for our photographer. Among those enjoying the events were Mr. and Mrs. Lloyd Johnston (in period costume), Mr. Cilford Vickers and Mrs. Dan Gilbert. The very active ladies of the Milo Garden Club held their first meeting of the season at the attractive home of Mrs. Claude Trask. As part of this year’s Milo Sesquicentennial celebration they were attractively costumed. One of the highlights of the summer festival held Saturday at Milo was the beard judging contest. 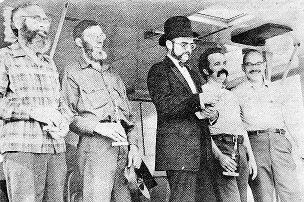 The winners were, left to right, Roger Trunks, trophy for the longest beard; Guy Kelley, fullest beard; Clyde Hughes, longest mustache; George Hamlin, fanciest beard and Dr. Ralph Monroe, fanciest mustache. BIRTHDAY TUNE – Members of the Penquis Valley High School band pause in front of the reviewing stand to play a brief concert. 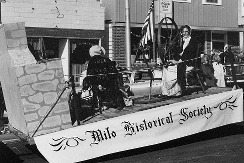 MILO − An hour-long parade highlighted Milo’s 150th birthday party Saturday as hundreds of County residents joined the town for a gala sesquicentennial celebration. Other anniversary activities included a water battle between surrounding fire departments, an antique car exhibition, an outdoor band concert, an arts and crafts show and a chicken barbeque. Evening fireworks capped the day-long event. 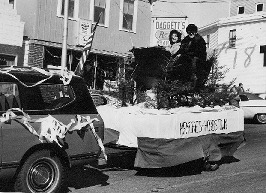 At the start of the celebration, more than 50 floats and parade de units traveled the people-lined, mile and a half route from Dexter Shoe Co. to the Legion field, giving spectators a dramatic review of the town’s historic heritage. On floats designed by Milo businesses, clubs, streets and organizations, dozens of residents donned old fashioned clothes to present a series of glimpses into life of the past. 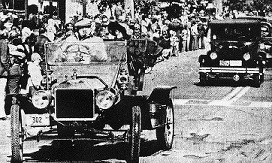 As many as 30 antique cars joined the parade before they were moved into position for the auto exhibition. “Honk your horn!” spectators cried as each smiling driver rolled by the reviewing stand. At the mid-point of the parade, the Penquis Valley High School band paused in its march to present a brief concert for the crowd. Parading units from area fire departments presented an interesting contrast between old and new equipment. From Sangerville came an old fashioned, hand pump unit that occasionally sprayed the onlookers when gusts of wind deflected the stream of water being pumped by its crew. A spokesman for the crew said the hand pump had been purchased and used in 1884. The crew calls the pump “Tiger,” he said. 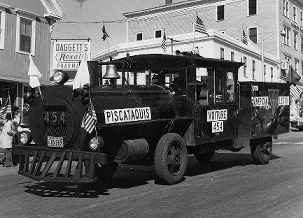 Near the close of the parade, eardrums vibrated painfully as modem fire trucks from Sebec, Dover-Foxcroft, Brownville and Milo promenaded through the center of town, their sirens screaming. 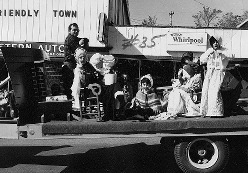 Among the streets entering floats were Kimball, D’Este, West Main, Outer Park, Albert and 1st and 2nd in Derby. Area horsemen pranced over the route in colorful costumes. Rounding out the parade was a team of Shriner cyclists. In the water battle, Milo and Brownville firefighters fought to a stand-off in two matches, with each town scoring a win. Dover-Foxcroft topped Brownville _in the day’s third contest. The water battle splashed a number of spectators who squealed with delight as the contestants tried to move a barrel along an.aerial cable stretched between two trucks. Through the afternoon, sesquicentennial visitors viewed arts and crafts displays and historical exhibits in the town hall. Most beautiful, “Old Fashion Garden” by the Milo Garden Club, most authentic, the West Main Street entry of’ the buckboard pulled by Dearlee’s Georgie Girl, morgan mare, with Milo’s Miss Maine Teenager contestant, Miss Betsey Shirley of that street, and her driver, Kenneth MacLeod as riders. Most original, the Mafia, sponsored by Daggett’s; best theme, tile Neoteric’s Club MFWC, “Old Fashion Living Room”, Best business entry, the Bangor and Aroostook freight train; best street, Albert Street with its older doll carriage winners of the summer festival. Best organization, the Milo Square Dance Club; and the best visitor unit, tile Anah Temple Honda Patrol. 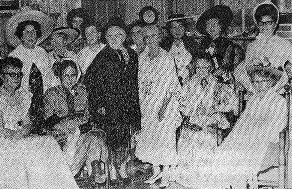 Judges were Miss Clara Owen, Mrs. Elizabeth Chase and Mrs. Kum Lee. 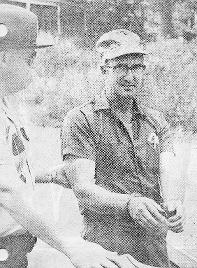 In the water battle, the Maine Forestry Department was declared the winner. attended from as far away as New York and Maryland. The parade started promptly under sunny skies and with a brisk wind blowing. Crowds lined the streets from the starting point on Park Street to the finish line on West Main Street. 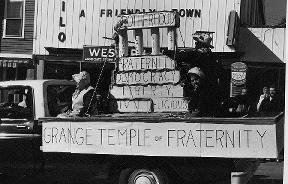 There were floats sponsored by the businesses of the town, friends, neighborhoods, schools and clubs. 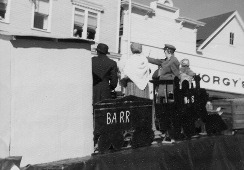 One of the main attractions was the display of the Bangor and Aroostook Railroad. 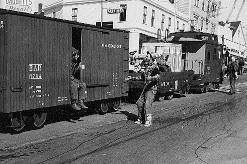 This entry created by volunteer work by the employes of the Derby Shop, ar and it was headed by the Derby yard switcher engine. bell ringing and whistle blowing. This engine was hauling replicas of a new 6.000 box car, an old Canfield box car (of 50 years ago), a flat car, and of course bringing up the rear, a little caboose. Other floats displayed historical articles and still others were just for the pleasure their beauty could bring. The Milo Garden Club did credit to their organization with the beauty of their display. Another entry featured an apple tree. The Penquis Valley High School added pleasure to the day with its music, and amusement was provided by the clowns and the “Just Married” riders on their little scooter cars. Little children were thrilled when “Smokey the Bear” waved in their direction. The many fire trucks with sirens in action added to the festivity. Car buffs were thrilled with the many antique autos and horse lovers with the beautiful horses and their talented riders. The Shriners with their talented motorcycle routine added still another attraction. The crafts display. arranged by the senior citizens was well patronized and the Historical Society held interest for many residents and visitors. Following the full day of events, a pleasurable evening got off to a good start with the outdoor band conert by the Penquis Valley High School Band and the performance by the majorettes. Fond recollections of the past were brought back to the senior citizens with an exhibition of fireworks. 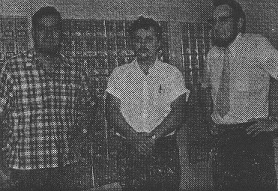 For want of knowledge as to whom to write, this non-resident with nostalgic connection with Milo and who has always regreted his having to miss the 100th Anniversary Celebration fifty years ago, wishes to use your paper to express appreciation and congratulations to all who made the 150th Celebration on Oct. 6, 1973 such a successful and memorable affair. Even the “Weatherman” contributed with one of those beautiful October days, complete with blue skies and magnificent autumn foliage, which any onetime resident of Maine carries in memory forever after. The parade deserves utmost praise for all who were involved as marchers, costumed float riders or unrecognized behind the scenes organizers, float builders or otherwise. Although all parts of it were worthy of praise and mention, two features inparticular were of interest to this writer; the buggy complete with horse and driver which was a duplicate of the one he and his sister used in riding from home In Sebec to school in Milo 1916-1917 and the other was the 1917 Model T Ford actually being driven, which was a duplicate of the one his father, Vernon K. Gould, purchased in 1917 and was the family’s “covered wagon” when migrating to New York State in September 1917. Probably few today are aware that for practical purposes it was the Model T Ford of 1917 which ushered in the motor age for Milo. Although doctors and a few others in Town had the luxury of crank started autos prior to that time, it was in that year that farmers began to acquire them. We vividly recall how memorable that year was with residents along the Sebec Road having autos for the first time. Besides the writer’s father, there were Leon Mitchell, Frank Weaver, and possibly Will Carver. After cranking up the motor, rushing to the cowl to “adjust the spark”, and fitting the side curtains in case of rain, trips to far away Dover (Maine) and return could be made in less than a full day previously devoted to them. The horseless sleigh was also a reminder of days gone by when the few autos were put into hibernation, following the example of bears of still earlier days. The exhibit of Arts and Crafts was not only interesting in itself but, with provisions for refreshments, furnished an an expected but most welcome opportunity for one of those reunions of old-timers for which Milo has been famous from time to time. The collection of relies of various categories which has been assembled by the Milo Historical Society and was viewed by so many interested people deserves congratulations to that active and dedicated organization. We non-residents look forward to publication of Its projected History of Milo. The Fireman’s Water Battle, which may be common in Maine, was a distinct and very interesting feature to people from areas where there are no such facilities for firemen to engage in such contests. There Is probably much less disposition to do so anyway on the part of firemen who handle hoses for the sake of pay. The celebration was well worth the trip from New Jersey. We hope others who missed the affair will be similarly rewarded by the 200th which we regret we expect to miss. We hope your staff will come out with a Souvenir Edition complete with pictures for which your equipment is justly famous. All pictures and articles on this page are from The Piscataquis Observer and The Town Crier. We are not sure as to what editions, as the information on this page came from a scrapbook posessed by the Historical Society. Special thanks to Seth Barden for scanning the pictures and creating this page!